Nuwara Eliya is small summer resort used by British to escape heat in other parts of country. Weather is very refreshing thought it can be a little be chilly at night so no surprise to see locals walking with jackets or sweaters on. I didn’t spend much time in Nuwara Eliya except visiting small botanic garden. There are no so much to see there, but I need to kill some time till my train arrives. Today’s plan changed after talking with our driver last night. There are two ways to go South from Nuwara Eliya. You can go by car, but there is better way. You can take the train from Nanuoya to Ella. Nanuoya railway station is located 10km (6 miles) from Nuwara Eliya. It seems there is no way to book 1st class ticket in observation car in advance, but our driver suggested to buy cheapest available tickets and latter upgrade it. Total cost was 750LKR. It is not the cheapest train trip, but it is really worth it and is the one of the best train trips I ever done. Railway pass Horton Plains National Park with pictures mountains, waterfalls, tea plantations and view to World’s end, the key attraction of the park. The train goes somewhere on that hill in front of World’s End. It takes about 3 hours to get from Nanuoya to Ella and then continue trip by car. 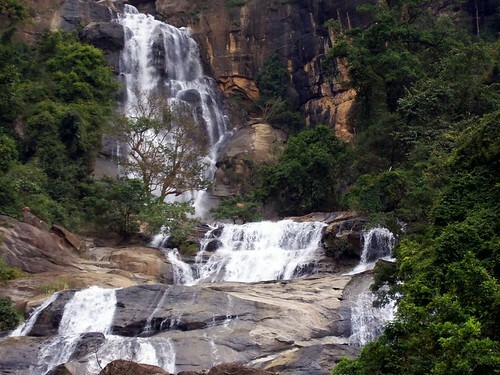 Couple kilometers from Ella there is one of widest waterfalls in Sri Lanka – Rawana Ella. It was still long way to go to the tonight’s destination Tissamaharama (or Tissa for short) which is gateway to Yala national park, but we decided to go even longer way. The shortest and fastest way would be by taking A2 highway (see the map). But alternative road B35 is much better. Why? B35 public road passes crosses western part of Yala national park and it is good place to see elephants and I saw more elephants today then on my safari to the Yala NP I took next day. Kataragama is another stop on this road. It is the most important religious piligrimage site in Sri Lanka and it is a holy place for Buddhists, Muslims and Hindus. It is quite village during day and is better to visit it at night when food offerings ceremonies start. The same as on second day it was already dark on arrival to Tissa, but we need to go to bed earlier anyway as it was booked safari to Yala NP for next morning. Early morning.. Get up at 4:00. Wow! Sri Lanka looks really beautiful! And the Sigiriya rock Fortress looked breath taking! I’m going to put this on my bucket list! Sri Lanka is nice country, but you need more then 5 days to really enjoy it. The Sigiriya rock Fortress looked breath taking! I’m going to put this on my bucket list! Thanks for sharing..
Sri Lanka is a country I’ve yet to visit in Asia but is a high priority. The scenery from photos I’ve seen look absolutely stunning. Wow! Great selection of pictures. I love the shot of the water falls. Hope I can visit the place. Thanks for the beautiful post of Sri Lanka. Your blog about Sri Lanka gets me excited for a trip to that beautiful place you’ve been to! Could you tell me which accomodation and transportation you used during the trip? Or travel agent you dealt with? Accommodation I was looking on the way as with tight schedule I didn’t know where we will spend next night. Driver knows a lot of places and will bring you to one depending on your budget.